We study diarylethene molecules (Figure) which switch between open (unconjugated) and closed (conjugated) form under UV / visible radiation and can be considered as molecular switches. 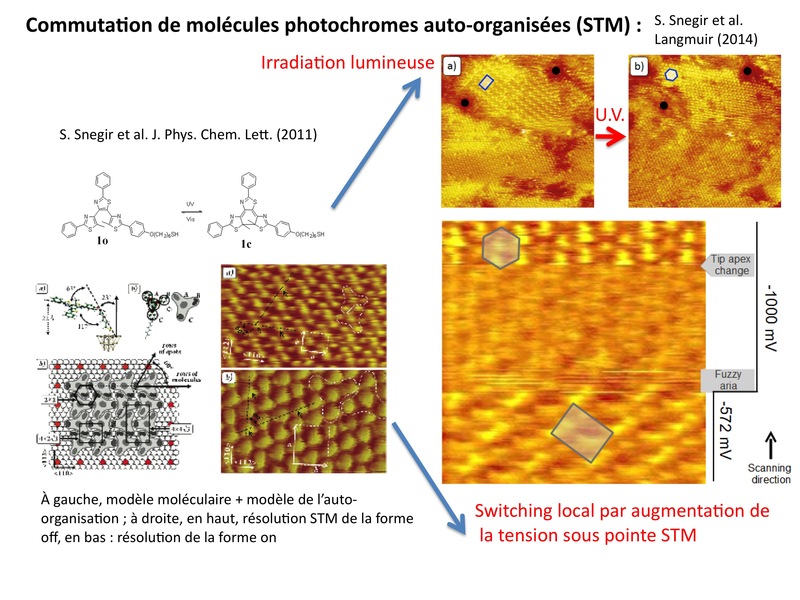 The question is to understand how the phenomenon takes place in the presence of substrate and in a dense molecular environment (2D self-assembled monolayers on crystalline substrate). We have identified the self-organization of diarylethene molecules on Au (111) in the open form and in the closed form . We have highlighted the switching on/off under light irradiation and locally under an STM tip . 2. Chirality of self-assembly . We have highlighted how, in the presence of the most basic Van der Waals interactions, intrinsic chirality appears when adsorbed molecules become ordered. This occurs if the molecular size is large enough, of the order of one nanometer . We studied the structural evolution of triphenylene molecules when azobenzene are incorporated in the six chains of the molecule (Figure), in order to ask the question of the role of the presence of hydrogen bonds between neighboring molecules. We highlight how the hydrogen bonds between adjacent chains transfer their chirality to the whole molecule, then to the all ordered network, even imposing the network crystallographic orientation relative to the underlying substrate Au (111). Collaboration : N. Katsonis (Twente University, The Netherlands), K. Uchida (Japan), A. Kapitanchuk, A. Marchenko, Institute of Physics in Kiev-Ukraine. 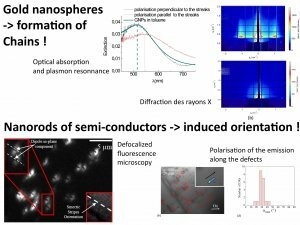 How does occur the self-organization of nanoparticles in distorted liquid crystals, how to control anisotropy of the electromagnetic coupling, for new optical properties ? What changes are induced in the hybrid film compared to liquid crystal films without nanoparticles ? 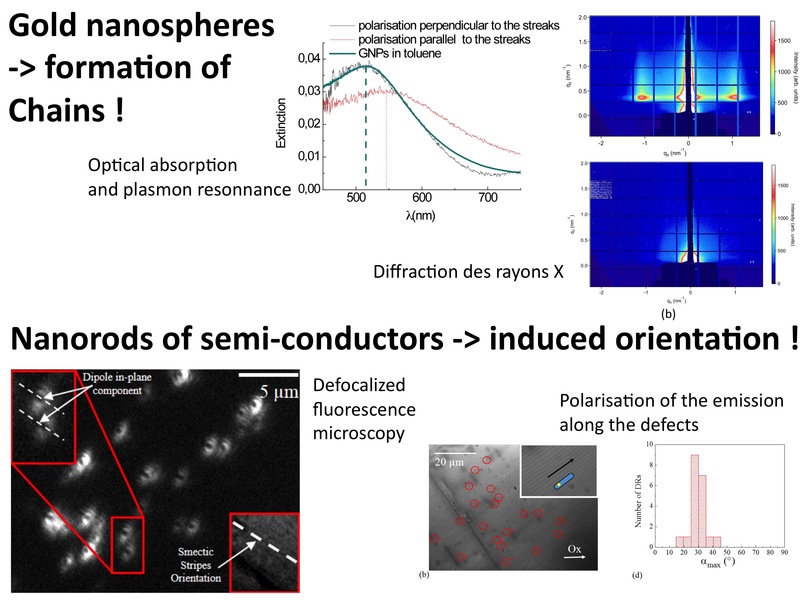 In the presence of oriented topological defects (oily streaks ), we show that nanoparticle chains are created, strictly oriented in the same direction (helicylinder axis), inducing anisotropic optical absorption (Localized Surface Plasmon Resonance - LSPR) controlled by the incident polarization, parallel or perpendicular to the liquid crystal defects . We show also that the electromagnetic coupling between the nanoparticles in the chains is managed by both the presence of the ligands around the nanoparticles controlling steric repulsion and Van der Waals attraction forces between the nanoparticles and the localization of nanoparticles in topological defects, which tends to separate the nanoparticles up to fit a maximum place in the core of the defect . Therefore a key parameter for the control of electromagnetic coupling becomes the evaporation of solvent which imposes a more or less strong interdigitation between neighboring nanoparticles ligands and therefore a more or less large Van der Waals attraction forces with respect to the repulsion between the nanoparticles induced by the liquid crystal. We studied nanorods CdSe / CdS (core-shell nanorods, so-called ’dot-in-rods’), scattered in the oily streaks. These are single photon emitters, such that unique nanoparticles can be selected by « antibunching ». We selected them and we shown by the study of the polarization of emission that the nanorods are aligned along the axis of hemicylinders with an accuracy of 6 °. 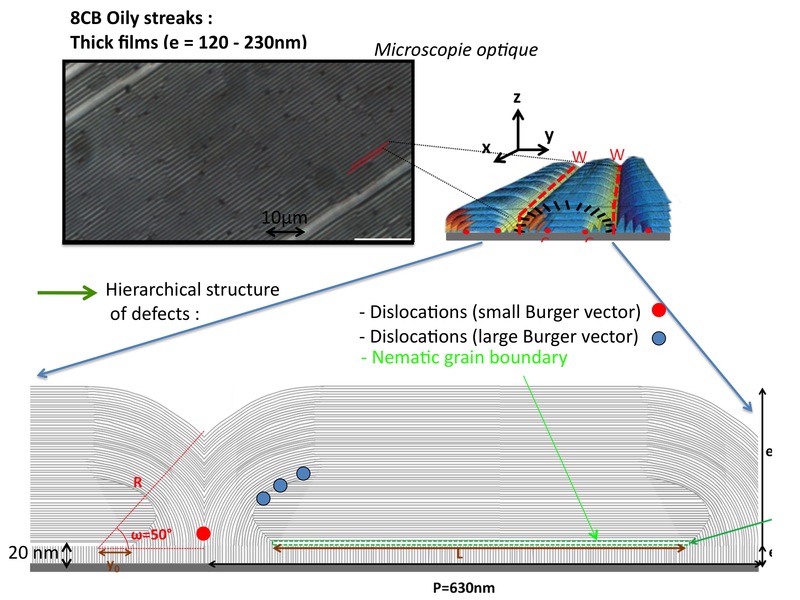 The presence of nanoparticles chains and oriented rods along the axis of hemicylinders shows that dislocations are more favorable traps for nanoparticles, in accordance with a hierarchical structure of defects in oily streaks  for the phenomenon of trapping nanoparticles. We are now trying to understand the origin of this hierarchy, in connection with the intimate structure of the defects, still unknown. This demonstrates in the same time how the study of hybrids may also allow for a better understanding of the structure of topological defects. 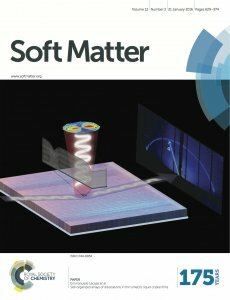 Finally, we now use this hierarchical structure of defects to build hybrid systems made of nanoparticles of different size and shape, which should occupy different kinds of defects, for a hierarchical structure of nanoparticles, differently organized in a same liquid crystal matrix, for new kinds of electromagnetic coupling between the nanoprticles. 2. Elastically deformed liquid crystal matrices and gold nanospheres [45, 50]. We study hybrid systems with nanoparticles in the presence of cholesteric liquid crystals, elastically deformed . We explore how to induce specific self-organization of nanoparticles, but also how the presence of the nanoparticles can stabilize this type of distorted matrices. We have evidenced anisotropic self-organization of nanoparticles, associated with a strong anisotropic plasmon resonnance [45, 50]. For the same nanoparticles than those used in presence of the smectic topological defects , we highlight formation of nanoparticle ribbons, of somewhat less defined orientation compare to the case of liquid crystal matrix with oriented topological defects. As opposed to the case of the nanoparticles trapped in topological defects, the distance between nanoparticles is very small, 0.6 nm, much less than the size of the grafted dodecanethiols ligands at the nanoparticle surface. This is interpreted as an effect of the disorder induced by the nanoparticles in the cholesteric matrix . This compression between the nanoparticles induced by the liquid crystal matrix indeed does not take place in topological defects, since the nanoparticles are then trapped within already disordered liquid crystal areas . In these elastically distorted matrices, we can expect a less restricted effect of nanoparticle size for the trapping phenomenon of nanoparticles. We then currently increase the nanoparticle size to explore how the nanoparticle organization is modified, for a better anisotropy of the induced self-organization.